Juryeonggu: A 14 Sided Die From The Golden Age Of Silla. The die was found in the city of Gyeongju which is also known as the most historic city in S.Korea due to the extensive number of historical remains. Many think of the city and surrounding area as being the most important cultural site in S. Korea, and it is the 3rd most visited tourist site after Seoul and Busan. Gyeongju was also important in the past and particularly during its’ ‘golden age’ (approx 600-800 AD) and was possibly one of the 5 largest cities in the world at that time. It had extensive trading ties, including to China and Japan, and was known to be a creative and vibrant city, with a wealthy and educated upper class. And wealthy people often have leisure time which needs to be filled, with games being a perfect way to socialize and pass the time. Each of the sides of the die had penalties or tricks that one was to perform, EumJuGaMu (food,drink,song,dance) was an acceptable way to pass time, and it is supposed that the juryeonggu added a touch more luck and fun to the overall entertainment. (The above translation of the instructions are from http://gyeongjulove.blogspot.com/2011/06/casting-14-sided-juryeonggu-anapji.html the web site of the City of Gyeongju. Other translations/variations appear on the web but these seemed the most easy to understand. It is not known if this type of die was totally of Silla origin or if it was an improvement and upgrade of Chinese dice, see image above, since 14 and 18 sided dice have been found in China dating back at least 2,000 years with a mix of numbers, blank spaces, or words such as win, and take a drink inscribed on them. Personally I think it likely that the earlier Chinese dice were known, but that someone in Silla took them to to the next level, and created an awesome drinking game. 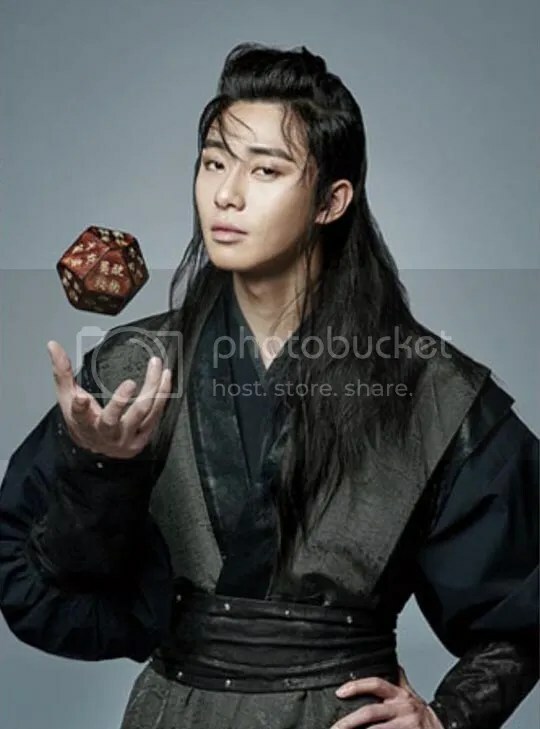 Korean drama fans may have seen replicas of this die show up in Sageuk such as in episode 6 of Queen Seondeok, and episode 1, and others, of Hwarang, The Flower Boys of Silla, but the really sad thing is that the original die they found in 1975 was destroyed while they were trying to preserve it. Only one has ever been found and it no longer exists. Hopefully another die will show up in future excavations, although wood tends only to survive long periods of time in anaerobic (oxygen free) conditions. Fortunately photographs were taken before the die was destroyed which has enabled replicas to be made. I have heard that you can buy replica dice and even a paper make your own, but I haven’t found a source as yet. I’d love a slightly more modern one, as in written in Hangul, or even a blank one so I could write on it in English. If anyone finds a source for a replica die please let me know. EDIT. A Korean friend found a hand made replica pair, one with original script, the other blank so I can have instructions in English engraved into it. Thanks Ken. One of the replica dice is shown above, but I can’t find out if they used these colors because they found traces on the original die, or if it was artistic licence. This one is now in the National Museum of Korea. This replica can be seen in the National Gyeongju Museum and I think looks closer to the photograph taken of the original before it was accidentally destroyed, but with the original photos being in black and white it is hard to be sure. I have since found a partial description that said it was black lacquer over hardwood oak, so maybe the black replica is more accurate? One report says it was 5.5 cm x 4 cm but I’m not sure if that is accurate as that seems small compared to what they show on the dramas and they must have based their version off of some information. I would love to see the original report on the die available in translation to see what it said about the die itself. The juryeonggu shape is so famous in Gyeongju that lanterns are made in the same shape, as are bread snacks. If I happen to find a source for buying replica juryeonggu I will post it here, until then I may try and find a blank die in another shape and create my own drinking game. Photo credits to original owners. National Museum of Korea. Gyeongju National Museum. You may also like Yut, Alkkagi, Jegi Chagi, and Hwarang, The Flower Boys of Silla. Category: Games, History, kdrama, Korean Culture, KPOP, Odds and Ends. I am also interested in finding a juryeongoo dice. Please let me know if you find a source or know of anyone that can make a reproduction. Thanks. Will do, and thanks for reading. Thank you Babette. I was given a blank one and one inscribed as the original was, so I’m ok for now. Will probably buy a couple more for friends next time I visit the National Museum in Seoul. Have a good day.